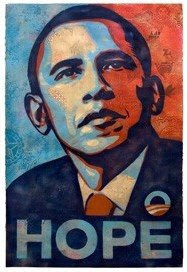 By now you've probably seen this poster which became an iconic emblem of the Obama campaign in 2008. Hundreds of thousands, perhaps millions, of these posters have been given away or sold since the inauguration of the President. But did you know that this poster was based upon this photograph? The photograph was taken on April 27, 2006 at the National Press Club in Washington, D.C. The photographer was one Mannie Garcia, a freelance photographer on assignment for the Associated Press. The Associated Press thereafter used the photograph to illustrate a story that it sent to its members, i.e., newspapers around the world. 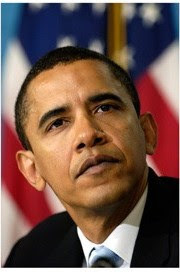 The story was about then-Senator Obama's concern about human rights in Dafur. This week, I didn't have to wander the web, the web came to me by way of a wonderful comment from M. Wasserman. The comment added valuable information to the article "If You've Got It, Flaunt It," about the Chicago photographer Joshua Smith, winner of the Silver Medal at the Paris Exposition in 1878. It also asked a question about examples of work by this family of photographers. In 1880 the 41 year old Joshua Smith is living in Chicago with his 29 year old wife Louise. Living with them is Louise's mother, Mary, and her 25 year old sister, Kate. Kate's occupation is listed as a Retoucher Artist, which may account for why she married a photographer; she worked in their world. It also appears that Smith created a montage of black babies similar to the one to the left, in 1881, titled "Little Ethiopians." He was elected President of the Photographers' Association of America in 1883 and authored many articles on the chemistry of photography. In 1900 I found Joshua and Louise living in Allegan, Michigan with Louise's brother Alfred E. Woollett. Joshua lists his occupation as landlord and Alfred lists his as photographer. 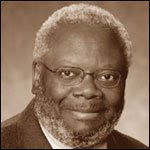 I have found two sites with work by Joshua Smith and one with work by George J. Klein. I found no work by A. E. Woolett. The following two photographs are contained on the Library of Congress website. It would appear that Joshua Smith was interested in panoramas and fires early in his career. Chicago, as seen after the great conflagration. Smith, Joshua. Panorama. ca. 1871. Boston, after the fire, November 9th & 10th, 1872. Smith, Joshua. Panorama. 1872. The Chicago History Museum has photographs in their archives taken by both Joshua Smith and George F. Klein. They have a photograph identifying the sitter as Joshua Smith. I can not be certain, as none of these images are online and even if they were I would not be able to identify Smith. 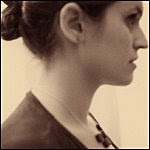 Thank you M. Wasserman for commenting and adding information to my collection of photographers. I would have loved to secure a photograph of Joshua Smith to have included with this post, but it would have been cost prohibitive. The Chicago History Museum charges a $50 permission fee for educational non-profit use per photograph. They also charge a production fee of $10. To secure the photograph would be $60. The permission fee is $50 per year. If this post is archived, as they are, I would be charged $50 per year by the museum for this one photograph. Anonymous. Heritage Slater Political Memorabilia and Americana Auction Catalog #619. Dallas : Ivy Press. 2005. Anonymous. The Year Book of Photography and Photographic News, for 1883. New York : Scovill Manufacturing Company. 1883. Kirby, Lynne. Parallel Tracks. Durham : Duke University Press. 1997. 1880 U.S. census, Cook County, Illinois, population schedule, Chicago, p. 377, dwelling 187 , family 240, Joshua Smith (Head); digital images. Ancestry.com (http://ancestry.com/ : retrieved 26 May 2009); citing NARA microfilm publication T9_199, roll 1,454. 1900 U.S. census, Casco, Michigan, population schedule, Allegan, p. 9b, dwelling 212 , family 212, Joshua Smith (Head); digital images. Ancestry.com (http://ancestry.com/ : retrieved 16 May 2009); citing NARA microfilm publication T623, roll 1,854. Good Morning. Smith, Joshua. New York. Cabinet Card. ca. 1880. Privately held by the footnoteMaven, Preston, WA. 2009. Chicago, as seen after the great conflagration. Smith, Joshua. Panorama. ca. 1871. From Library of Congress, Prints and Photographs Division, Panoramic Photographs Collection. Link (May 2009). Boston, after the fire, November 9th & 10th, 1872. Smith, Joshua. Panorama. 1872. From Library of Congress, Prints and Photographs Division, Panoramic Photographs Collection. Link (May 2009). When dating a photograph one of the areas to consider is the costume of the sitter. 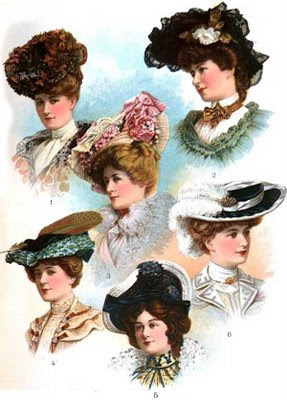 Here are a selection of hats that were stylish in the Autumn of 1902. Are they similar to those in one of your family photographs? When dating, please remember this is only one aspect of ascertaining the age of a photograph and is notoriously the least reliable. Please select picture for larger view. No. 1. — This hat in the becoming toque shape is made of shaded Autumn foliage with berries intermingled, and a bow of velvet in a shade to harmonize with the predominating tone in the foliage is at the back against the brim. No. 2. — A large hat made of black velvet and black Chantilly lace is here shown.' The crown is low and formed of the velvet, while the wide brim of velvet is softly draped; the lace falls over the edge all around, with ends resting over the hair at the back. A white velvet rose and Autumn leaves are placed against the brim at the left side where it flares. No. 3. — For this attractive, youthful hat cream satin Liberty, finely plaited and edged with a narrow lace, was arranged in a succession of rows over a chiffon-covered wire frame. Loops of rose-colored ribbon are disposed at the left side of the brim, and a wreath of tiny rose-buds is also arranged on the brim facing. A soft coil of the ribbon encircles the low crown. No. 4. — The smart hat illustrated here is made of blue and green mixed fancy felt braid. Dark-blue velvet is draped on top of the low crown, and a speckled quill is thrust through it, while a bow ef the velvet arranged at the back provides the touch of completion. No. 5. — This hat of dark-blue and white felt braid is recommended for youthful wearers. The crown and a portion of the brim are of the blue braid, the white braid giving a pleasing finish to the edge of the latter. A band of dark- blue velvet is arranged across the brim facing over the edge and encircles the crown, and is formed in a bow at the back. A cabochon of the blue felt is placed on the edge of the brim, and one of the same size secures the velvet band on a bandeau that rests on the head at the left side. No. 6. — Unusual charm marks this picture hat of black velvet. White Liberty satin is arranged in soft folds on the edge of the wide, straight brim and also encircles the broad, low crown, and a band is brought over on top of the crown and over the edge of the brim at the side. A white ostrich plume, secured by a pearl cabochon, completes the hat. Anonymous. "The Season of Millinery." Delineator, October 1902, pg. 550-553. This photograph of Portus Winter is another I collected while vacationing in Montana. The photograph was almost perfect, contained a handsome young man in a World War I uniform, and a beautiful background. The work of the photographer was excellent. It called to me. Now read what I've discovered about the photograph and its photographer. Today, Memorial Day, Shades profiles two photographs of two men. Young Portus Winter, a doughboy in World War I; and the photographer, F.O. Lindquist, who took Winter's portrait and served in the Spanish American War. Both men answered the call to serve their country, each in a different time, in a different conflict. The photograph of Portus Winter contains a notation with his name "summer of 1917." Winter wears the World War I uniform of an infantryman, commonly referred to as a doughboy. 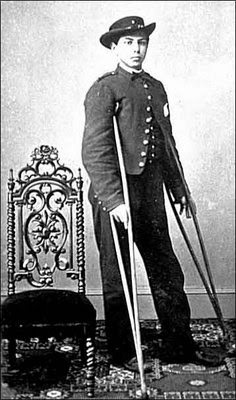 You can see from the photograph of the Civil War infantryman that the brass buttons he wore were indeed large and globular. Portus Winter was born 15 Sep 1898, in Eau Claire, Wisconsin, the son of Robert I. and Lottie Winter. Robert was a railroad agent and Lottie kept the home and cared for Portus and his two younger sisters, Ethel and Margaret. It appears that sometime prior to the summer of 1917 Portus joined the Wisconsin National Guard. By proclamation of President Woodrow Wilson, the members of the Wisconsin National Guard were drafted into the military service of the United States, on July 3, 1917. 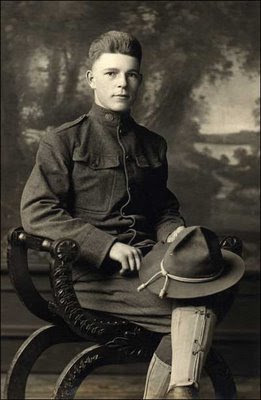 The inset of this photograph shows Winter wearing the dull bronze collar insignia of the Wisconsin National Guard, which has not yet been replaced by the United States insignia. Winter is holding a Campaign hat with cording, that as an infantryman, was probably light blue in color. His is wearing fawn colored cloth spats worn over dark low cut shoes. At the end of the war, Winter returns to live with his family in Wisconsin and is recorded as living in the family home in the 1920 census. Approximately a year after this census, Portus marries Bernice Christine Rudie. 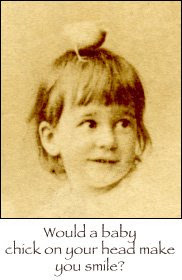 Bernice was born 6 August 1900 in Sisseton, South Dakota, the daughter of Knudt Nelson Rudie and Millie Augusta Hegge. 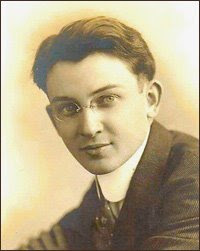 Knudt was a minister of the Lutheran Church in Roberts, South Dakota, in 1910. How Portus and Bernice met is unknown. 1930, finds Portus' parents still living in Wisconsin, but both Portus and Ethel are gone from the family home. Margaret is still living with her parents and two young children have been added to the home, Robert R. (8) and Vivien M. (6). The census lists young Robert Winter's Mother as Margaret. I believe this is incorrect as Robert's mother was born in South Dakota. Margaret was born in Wisconsin. I believe Robert and Vivian are the children of Portus and Bernice who are homesteading in the Swan Valley near Missoula, Montana. Portus and Bernice are lodgers in the home of Annie Graham who takes in lodgers in Missoula, Montana. Portus lists his occupation as owning a dude ranch and Bernice is a teacher in the Government School. Bernice dies in Missoula 5 July 1985. Portus died April 1979 in Bernalillo, New Mexico. It is unknown if both Bernice and Portus moved to New Mexico and Bernice returned to Missoula after his death or if Portus went to New Mexico alone. This photograph of Portus Winter was taken in the summer of 1917 by F.O. 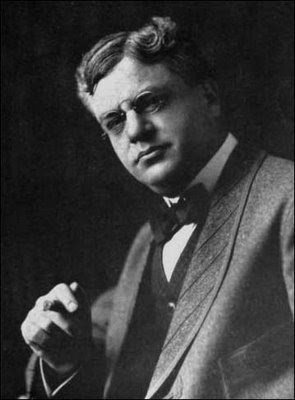 Lindquist of Superior, Wisconsin. Superior, attracted Lindquist in 1889 when he was just a lad. He went into the drygoods business as a means of livelihood, and for five years he made it the school of his commercial training. His natural artistic bent then led him to take up photography under the tutelage of E. C. Berryman, ex-president of the Photographers' Association of Wisconsin, and shortly afterward he was entrusted by Mr. Berryman with the management of one of his branch studios where he met with success. 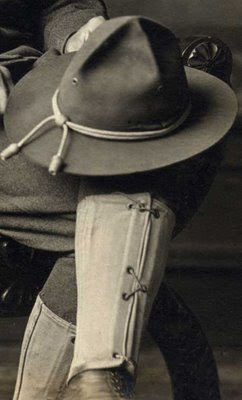 This connection was brought to an end to take up his duty for his country, when in 1898 he enlisted to go to the Spanish-American war. His knowledge of photography, while his regiment was stationed in Porto Rico (sic), enabled him to preserve some very interesting experiences in the shape of lantern slides, which he used in connection with frequent lectures he gave for the benefit of his townspeople. Notwithstanding this, he never neglected the ground floor photographic studio where he conducted business successfully for sixteen years at the time of Portus' photograph. His progressiveness and alertness showed a forward stride from year to year in both his workmanship and equipment. He always kept pace with new improvements and processes. Ansco Company. Portrait, Binghamton, N.Y. : Ansco Co. 1914. Hogg, Richard M., Norman Francis Blake, John Algeo, Roger Lass, Suzanne Romaine, R. W. Burchfield. The Cambridge History of the English Language. Cambridge : Cambridge University Press. 2001. O'Donnol, Shirley Miles. American Costume, 1915-1970. Bloomington : Indiana University Press. 1989. Wigmore, John Henry. United States. War Dept. Committee on Education and Special Training. St. Paul, Minn. : West Pub. Co. 1919. 1910 U.S. census, Menomonie Ward 2, Wisconsin, population schedule, Dunn, p. 6a, dwelling 113 , family 120, Robert I. Winter (Head); digital images. Ancestry.com (http://ancestry.com/ : retrieved 16 May 2009); citing NARA microfilm publication T624, roll 1,178. 1910 U.S. census, Menomonie Ward 2, South Dakota, population schedule, Roberts, p. 6a, dwelling 113 , family 120, Knudt Nelson Rudie (Head); digital images. Ancestry.com (http://ancestry.com/ : retrieved 16 May 2009); citing NARA microfilm publication T624, roll 1,178. 1920 U.S. census, Menomonie Ward 2, Wisconsin, population schedule, Dunn, p. 8b, dwelling 178 , family 207, Robert I. Winter (Head); digital images. Ancestry.com (http://ancestry.com/ : retrieved 16 May 2009); citing NARA microfilm publication T625, roll 2,076. 1930 U.S. census, Menomonie Ward 2, Wisconsin, population schedule, Dunn, p. 7a, dwelling 150 , family 167, Robert I. Winter (Head); digital images. Ancestry.com (http://ancestry.com/ : retrieved 16 May 2009); citing NARA microfilm publication T626, roll 2,667. 1930 U.S. census, Missoula County, Montana, population schedule, Missoula, p. 4a, dwelling 69 , family 92, Annie Graham (Head); digital images. Ancestry.com (http://ancestry.com/ : retrieved 16 May 2009); citing NARA microfilm publication T626, roll 2,667. South Dakota. Department of Health. "Births, 1856-1903." Ancestry.com. http://www.ancestry.com : 2009. United States. Social Security Administration. "Social Security Death Index." Database. Ancestry.com. http://www.ancestry.com : 2009. Entry for Portus Frank Winter, no. 516-18-9837. Portus Frank Winter. F.O. Lindquist. Card Mounted Photograph. 1917. Privately held by the footnoteMaven, Preston, Washington. 2007. 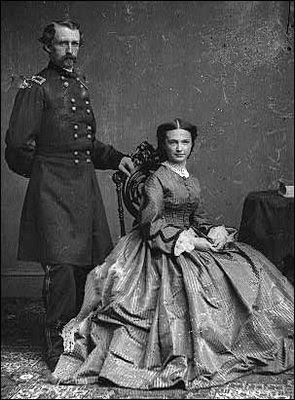 General George Custer and Wife. Anonymous. Glass Negative. ca. 1860 - 1865. Digital Collections : Prints and Photographs. Library of Congress. http://www.loc.gov/index.html : 2009. Portrait of Pvt. Charles Mitchel, Company D, 107th New York Volunteers, U.S.A. Brady National Art Gallery. Washington, D. C. Carte De Visite. ca. 1860 - 1865. Digital Collections : Prints and Photographs. Library of Congress. http://www.loc.gov/index.html : 2009. In keeping with May being the month of Mother's Day, I'm going to show you how I created a scrapbook page in honor of my own dear mother. To begin with, I made a list of ideas/items I wanted to incorporate in my page. 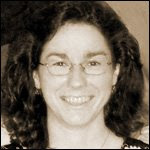 This page honors my mom so of course I wanted to feature a photo of her. I also wanted to use a yellow-based color scheme since yellow was her favorite color. It always reminds me of her. My mom was very proud of her Polish heritage and Catholic faith so I wanted to find way to incorporate symbols of these in the page. She was an excellent cook and baker and no scrapbook page would properly honor her without some reference to these as well. And then there was her green thumb... she grew wonderful fruits and vegetables in her backyard and boy could she coax roses to bloom! Last but not least, she loved to dance the Polka! There is a tiny kernel of truth in that final scene from Indiana Jones and the Raiders of the Lost Ark, when we see a box holding the Ark of the Covenant put on a shelf in a warehouse full of thousands and thousands of like boxes. In much the same way, all archives and libraries have hidden collections like this, though perhaps not so vast and not so concealed. But they are there. The beaming babies to the left were well-known in the world of photography in 1878 and probably famous in 1880. The photographer, Joshua Smith of Chicago, decided to enter a vignetted composite of his photographs of children and babies in the Paris Exposition of 1878. His display was next to Sarony's, a very advantageous position for a new competitor, as Sarony was a famous award winning photographer at that time. They would certainly stop and look. The British press wryly stated Smith was vying for public favor, particularly by the ladies. Yes, women have always been an easy mark for a photograph of a baby. But were the judges women? In 1878, a women having such an influential position in the world of photography would have been very unlikely. 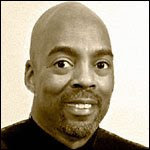 Listed as Joshua Smith, "instantaneous photographer," of Chicago, he exhibited a sheet 21 x 16 inches covered with portraits of babies and very young children. There were nearly one hundred juveniles' portraits arranged and vignetted merging one into the other. The press found this to be "a very excellent effect. There are all the most unaccountable positions that babies alone can take, and that we cannot imagine, as well as the hundred-and-one facial expressions so varied and so dear to all doting mammas." The British Photography Journal explained that Smith, in quaint American phraseology, had labeled the exhibit "We came all the way from Chicago." That publication described the layout and quality of Smith's exhibit: "The printing is firm, the whites pure (as in all good American printing), and although evidently the most rapid exposures have been given, the half, tones and modelling are perfect, while the shadows are in due keeping. This central picture is surrounded by scores of cartes de visite of babies and little children fastened to the background of the frame with drawing-pins, and so clamped down as to make the cartes take a vertically round surface. They are vignetted portraits in the English fashion." Gold Medal — To Napoleon Sarony of New York. Silver Medals — To the Continental Photographic Company and F. Gutekunst of Philadelphia; James Landy of Cincinnati; Joshua Smith of Chicago. Bronze Medals —T0 Theodore Gubelman of Jersey City, New Jersey; F. W. Guerin of St. Louis; and Lafayette Seavey of New York. Honourable Mention — To J. H. Beal and E. Gurney of New York. Is this cabinet card a facsimile of the actual Silver Medal display? Most probably not. 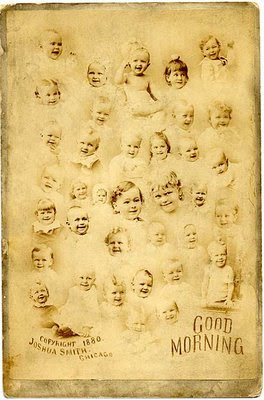 This appears to be an abbreviated version of the display used by Joshua Smith, as it does not contain hundreds of children's photographs, but rather a select few. Smith appears to be a savvy businessman for his time. He has produced this cabinet card to take advantage of his Silver Medal win in Paris, using the entire card as an advertisement for his photographic studio. 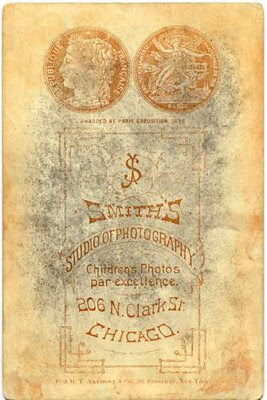 The front demonstrates what is stated on the reverse, "Children's Photos par excellence." The photograph itself has been copyrighted. 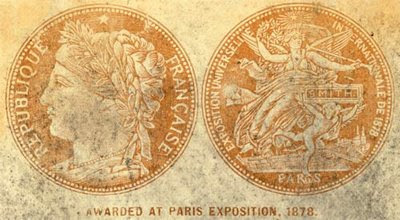 The medal won in Paris is printed at the top of the cabinet card verso. He lists his studio address making this an excellent advertisement for his studio and the type of work for which he is known. But Smith has gone one step further. He has licensed the production and sale of this cabinet card to E. & H.T. Anthony, their name being noted at the bottom of the verso. E. & H.T. Anthony was the dominant retailer and photographic manufacturer in the nineteenth century in the United States. They became famous through their association with Mathew Brady, selling reprints of his Civil War photographs. It was said Brady had amassed a large debt to Anthony for cameras and supplies. The selling of carte de visites, cabinet cards and stereocards help to alleviate the debt. At the time Smith licensed his card to Anthony they had a huge marketing and distribution network. They produced in excess of 3,600 cartes per day from a selection of over 4,000 images. In 1863 alone, Anthony had earned over $600,000. Of course we have no idea what Joshua Smith's licensing agreement was with E. & H.T. Anthony, but it would appear to have been the right move. So, how old is this particular cabinet card titled, "Good Morning?" Although the medal was won in 1878, the card is copyrighted 1880. 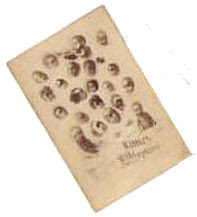 Some of the vignetted baby heads may have been taken for the 1878 Paris Exposition, but not added until 1880. And some of the vignettes may be 1880. So this card was produced after 1880. It is the E. & H.T. Anthony information that gives us the closest approximation of a date. It lists the company name and address as, E. & H. T. Anthony & Co., 591 Broadway, New York. Prior to 1863, the company had been called Edward Anthony. It was called E & H.T. Anthony in 1863. The company moved from 591 Broadway to to 122-124 Fifth Avenue, between 17th and 18th Streets, New York in the year 1899. The cabinet card is copyrighted 1880. My conclusion is the card was manufactured between 1880 and 1899. This charming cabinet card also puts to rest any assumption that there were no smiling babies at this point in photographic history. Joshua Smith, must have known the secret. Hannavy, Joshua. Encyclopedia of Nineteenth-Century Photography. New York : Routledge. 2007. The British Journal of Photography. Vol. XXV. London : Henry Greenwood. 1878. New York Times, 17 August 1878. Web Edition. : 2009. "Some great photos of women wearing a pince-nez. You may use any of the few photos I have of women posted on flickr.com under pince-nez...the majority of photos in my collection are of young men wearing a pince-nez. You'll find some detailed historical info there as well. Pince-nez eyeglasses were by far the most popular type of eyewear from the late 1880's until 1920, especially the rimless type. Contrary to popular belief, a perfectly fitted pince-nez stayed securely and very comfortably attached to the bridge of the nose at all times. Pince-nez in that era were referred to most often as eyeglasses. Spectacles had arms or temples. Eyeglasses and Spectacles were unisex until the late 1930's." Pince-nez, who collects young men wearing pince-nez eyeglasses, is my mirror image, the other side of my women wearing glasses coin. There are a few women sprinkled in this collection, as I have collected a few men. They often come in pairs. Each of the photographs contains some very well researched historical background. Some of these photographs are so unique, this collector has a great eye for a good photograph. I thoroughly enjoyed flipping through this unique photo album of young men wearing pince-nez eyeglasses. I think you will as well. The photograph above is used in the opening of this photographic set on Flickr all rights are those of the owner. I found no contact information and would like to have the owner email me please. In doing research into General Sterling Price for my own family history, I found this amazing volume of books on photographing the Civil War. 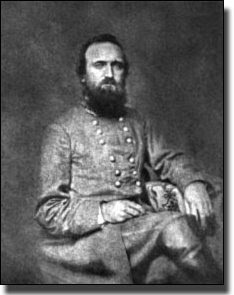 Below is a photograph of Stonewall Jackson, a man who did not like to be photographed, and the circumstances behind this portrait found in Volume 10 of The Photographic History of The Civil War. Jackson, a modest hero, nearly always shrank from being photographed. At the height of his fame he answered a publisher's letter with a refusal to write the desired magazine article or to send any picture of himself, though the offer was a very flattering one. The photograph above was made in Winchester, in February, 1862, at the Rontzohn gallery, where Jackson had been persuaded to spend a few minutes by the earnest entreaties of General Bradley T. Johnson. Some five months later Jackson was to send Banks whirling down the Shenandoah Valley, to the friendly shelter of the Potomac and Harper's Ferry, keep three armies busy in pursuit of him, and finally turn upon them and defeat two of them. This, with the profile portrait taken near Fredericksburg, represents the only two sittings of Jackson during the war. Captain Frank P. Clark, who served three years in close association with the general, considered this the best likeness. Miller, Frances Trevelyan, Editor. The Photographic History of The Civil War. 10 volumes. New York: The Review of Reviews Company, 1911. You know to scan your precious photos at no less than 300dpi. You know to save the archival photos in the TIFF (or tif) format. You know to wear lint-free gloves when handling the pics. 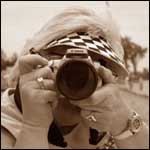 The goal is to have the photos in your genealogy program or family tree looking good. I've stated before that you shouldn't be afraid to crop your pictures.